A rising tide of violence in Iraq is driving up prices at the pump. The hike in gas costs follows the battlefield successes of the Islamic State in Iraq and Syria (ISIS), an al Qaeda breakaway group backed by Sunni fighters and other groups, in northern Iraq. The cost of crude rose Friday afternoon to nearly $107, a 10-month high, amid fears that the mounting insurgency there could lead to major disruptions of oil shipments. Brent crude futures, an international benchmark, climbed 54 cents to $112.96. Iraq is the third-largest exporter of oil in the world and has the fifth-largest crude reserves, according to the Energy Information Administration. 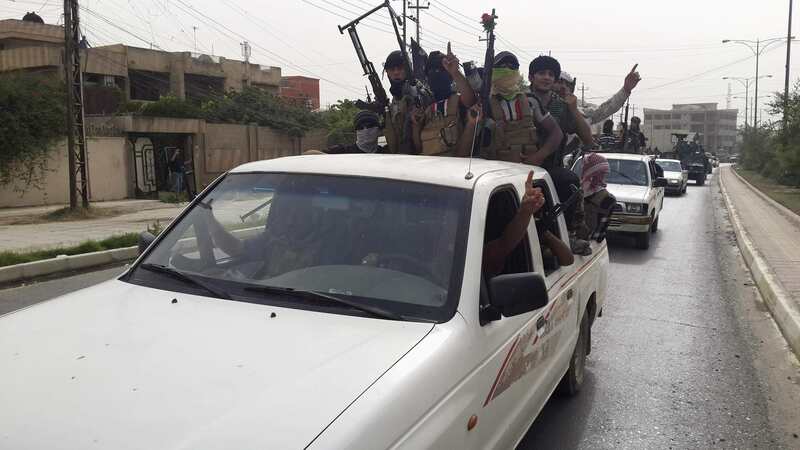 ISIS: Who are the Islamic militants challenging Iraq? "It is guaranteed that consumers will pay higher gas prices in the coming days, due to the turmoil in Iraq," said Michael Green, a spokesman for AAA. "The price of oil has gone up in recent days due to the fact that the production in Iraq might be curtailed and there could be increased conflict in the Middle East. And whenever oil prices go up, that is going to affect you at the gas pump." Gas prices in Michigan, Indiana and Ohio are already moving higher, along with prices in cities in Kentucky, Illinois and other nearby localities, Patrick DeHann, a senior petroleum analyst, blogged Friday at GasBuddy.com. That rise is "a harbinger of what's to come to the rest of the nation," he said. DeHann acknowledges that the situation in Iraq remains fluid, and no one is certain to what degree prices will rise, or for how long. But he expects most parts of the country to see a slight increase in prices over the next week, predicting that the national average for a gallon of gas may rise a "few cents" above Friday's level of $3.64. That would be only slightly more than what consumers were paying a year ago, when a gallon of gas went for $3.63, according to AAA. Yet while gas prices are likely to climb, at least in the short term, a major disruption in global oil supplies is unlikely so long as the crisis does not escalate, according to the International Energy Agency. Indeed, experts downplay the risk of a surge in gas prices of the kind that followed the 1973 OPEC oil embargo, prompted by that year's Arab-Israeli war, and the 1979 oil shock, which was spurred by the ouster of the Shah of Iran. "This is not 1973 or 1979," said Nicholas Colas, chief market strategist at brokerage firm ConvergEx Group. Don't expect odd-even license plate gasoline rationing or long lines at the pump, he continued. Although gas prices tend to rise during the summer driving season, that increase is because of growing demand. Colas also noted that the average price for a gallon of regular gas remains close to what is was a year ago. "We don't expect this number to top $4 a gallon," he added, "regardless of what happens in Iraq."